Scharzfels Castle, near Herzberg in the southern Harz foothills, was erected to protect the nearby monastery of Pöhlde. It may go back to the 10th century when Pöhlde became the widow's seat of Otto the Great's mother Mathilde (1). But I'll leave its history to another post. The remains today represent various stages of the castle's development. The trip to Scharzfels Castle made for another nice summer afternoon tour. It is not so hot any longer, and the two miles ascent through a beech wood made for a good, though not too stressful walk. There's a little café in the former inner bailey, so we got some ice cream and Alsterwasser (a mix of beer and lemon juice) as reward before we explored the castle. Scharzfels Castle is situated on a montain ridge 150 metres above the Oder valley and 376 metres over NN. Its inner bailey was erected on a 20 metres high dolomite cliff with steep sides, which made the castle pretty much unconquerable in the Middle Ages. It is this eagle nest situation which makes the Scharzfels interesting. There is not much left of the buildings (there had been at least a keep and a palas with a hall and living quarters, as well as the usual outbuildings like stables and granaries) and walls, but the remains and the caves in the dolomite rock are a lot of fun to explore and make for some nice photos. Nothing is left of the outer bailey except the well house. A staircase from the 19th century leads to the inner bailey, surely an easier access than what may have been there in the Middle Ages. The plateau on top of the dolomite rock is 20x60 metres with several natural and man made caves, thought not as many as in Regenstein Castle. The stone buildings had been erected on the rock or built into crevices. Only some ruins of those remain today. Scharzfels Castle was inhabited for a long time, changing possessions more than once. It was turned into a fortress in the 17th century, serving as garrison and prison. During the Seven Years War, the castle was conquered by the French (1761) and mostly destroyed. King George V of Hannover (and 2nd Duke of Cumberland) liked his picturesque ruins and rebuilt parts of the castle in 1857. Among his additions is the staircase that now leads to the gate of the upper bailey. But except for that one his buildings have been destroyed and dismantled. But the castle is still an interesting combination of natural and man-made features. The trees got a bit in the way of a good picture of the backside of the dolomite rock. There were some freeclimbers around, and they managed to get on top quite easily. But they were not not clad in mail and dragging swords and spears around. Plus, whoever tried to attack Scharzfels first had to get up the hill, and I'm sure the castle garrison had some fun ideas how to deal with assailants. The worst I had to deal with was a pebble that had found its way into my sandal. 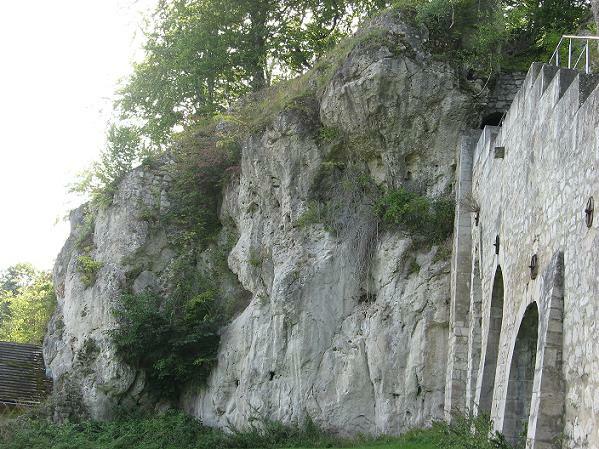 1) In a charte dating to 972, Emperor Otto I grants the lands and village of Scharzfeld to the monastery in Pöhlde. This may have included a castle. But the castle itself first comes into focus in a charte by Emperor Lothar of Süpplingenburg in 1131. I am so jealous that you live in country with so much great history and cool old buildings to check out! What a brilliant position for a fortification! No wonder it remained invulnerable for so long. Oh what an incredible looking place, I would just love to have this on my place. Thanks for sharing this. Lovely post; full of interest and great photographs. I can't help feeling that the pebble in your sandal was a bit like the grain in the oyster shell that produced the pearl! Oooh, I love caves - I would have been right there with you! Is it my imagination or are there quite a few German castles that are part rock/part man-made? By the way - 'Duke Heinrich Julius of Braunschweig-Wolfenbüttel' - that is a fantastic name. Any chance you might work it into a story lol? I'm grateful to live here. and no comfortable staircase like today. Though I do pity the masons and workmen who had to deal with that sort of terrain. Lol, I got that pebble out quickly. No fun walking with those poking into your big toe. there are some. I think it's the difference between the Norman castles on flat terrain which made up for it with really big walls but else followed a pattern, and the German hilltop castles that had to deal with limited space and thus developed some inventive structures. Though Scottish castles like Dunstaffnage are a bit of a mix - very massive but more adapted to the landscape than your average Norman castle. we have a bunch of those double names. Thackeray pokes some fun at it in the Germany chapter in Vanity Fair - Countess of Schlippenschlappen or what it was. Lovely photos and really interesting information, too. Lol, Constance, I'll make sure to hide in one with caves if you march in with your army.